Hajime Isayama’s Attack on Titan has become an international hit, and like most international hits, it’s branched out into other media and product lines. It’s been adapted into live action, anime, video games, visual novels, audio plays, light novels, and now… a Choose Your Own Adventure novel! 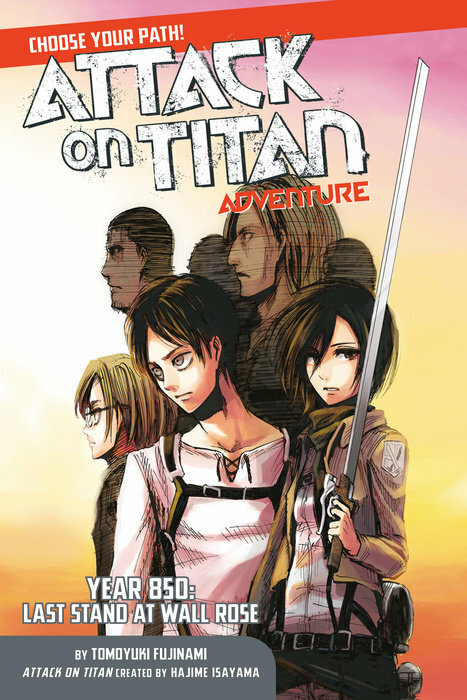 Set during the Siege of Trost, the opening arc of the manga, Attack on Titan: Choose Your Path Adventure allows readers to take part in the the battle and fight alongside Eren, Mikasa, Armin, and the rest of their fellow cadets. Your decisions can influence the outcome of the battle, and even cause it go in new and unexpected directions unseen in the original series or its various adaptions. Will Eren and his friends die at the hands of the Titans? Will the walls fall, allowing the Titans to overrun humanity once and for all? And most importantly, will you survive long enough to find out? The Choose Your Own Adventure format was a staple of the young readers in the 80s and early 90s. Part novel, part role playing game, the novels were written in the second person and allowed readers to take on the role of the story’s main character and decide its outcome based on various decisions they’d make. At the end of every “chapter”—and I use that term very loosely—readers would be presented with a multiple choice question whose answer would change the direction of the story. At its most basic, it could be something along the lines of “do you go right or left?” and each decision would lead you down a different path, some of them were good paths, while others led to an early doom. While Tomoyuki Fujinami sticks to this basic format, he also adds in several new “game mechanics” which make Attack on Titan: Choose Your Path Adventure a more complex experience then the simple multiple choice format of old. You accrue affinity points for certain characters based on your actions, while also keeping track of who’s alive and who’s dead via a roster page reminiscent of those in the Attack on Titan manga, both of which can affect the outcome and offer up alternative paths for your to take. This means you’ll want to read this with a scrap of paper nearby so you can keep track of who you’re friends with and who died. If those two mechanics weren’t enough, there are also a number of other clues and hints that pop up throughout the book, sometimes through the visuals provided by Ryosuke Fuji and Toru Yoshii. These all combine to make Attack on Titan: Choose Your Path Adventure a surprisingly layered game, with a lot of different outcomes and possibilities. In writing this review, I went through three different paths, each one very different, and it really felt like I hadn’t even scratched the surface of the book. Despite these new mechanics, like most Choose Your Own Adventure books, Attack on Titan: Choose Your Path Adventure is a fairly breezy read. Tomoyuki Fujinami crafts a story that is familiar to long time Attack on Titan fans, but offers new perspectives and takes on those situations. Unfortunately, like most books of this nature, that results in a pretty plot heavy style. You don’t get to learn much about the main character, because you are the main character. Instead it feels like a lighter-than-normal light novel. While this may seem like a knock, it really isn’t. You don’t really read something like this for in depth plot or character exploration. You read it because it’s a fun way to pass an hour or two in the backseat/airplane/train/bus while traveling for a vacation. While Attack on Titan: Choose Your Path Adventure won’t be winning any awards for writing, it is a perfectly fun and enjoyable way to burn a few hours. With the added mechanics, it has a bit more complexity than the Choose Your Own Adventure you might have grown up with, adding a little more “replay” value to it than the older books from years gone by. It’s not an essential item for Attack on Titan fans by any stretch, but it’s a fun little oddity and way to kill a few hours here and there. Attack on Titan: Choose Your Path Adventure is available now from Kodansha Comics. Review copy provided by the publisher. I read the heck out of the Carmen Sandiego CYOA stories when I was young. I’ve thought about picking this up a few times, and now I’m intrigued since it isn’t just dodge left –> you’re dead type stuff. I grew up on the old Dungeons & Dragons CYOA books. Reading this had me looking them up on google and wishing they were still available. Yeah, I was really surprised at how in depth this was and how many different options and mechanics it had. They add a little something extra to it that makes it feel a bit more RPG-ish. I wonder how popular this format is in Japan? Are there CYOA books for other franchises, or…?